I have been using Airtel 3G Data Card since long and I mainly use it even now to download and read study material online. I never thought I would be posting these below mentioned screenshots for Airtel 3G Data Card Download Speed Test as I just tested them to download torrents which are ethically wrong most of the times due to copyright issues. The review and speed test is just for the educational purpose and is not meant to break any laws or infringe any copyrights. One thing that I am concerned about is the download speed of Airtel 3G while you are on the move is pathetic and is 2G. It even disconnects some times while you are travelling in a vehicle and using or downloading something of the 3G network. 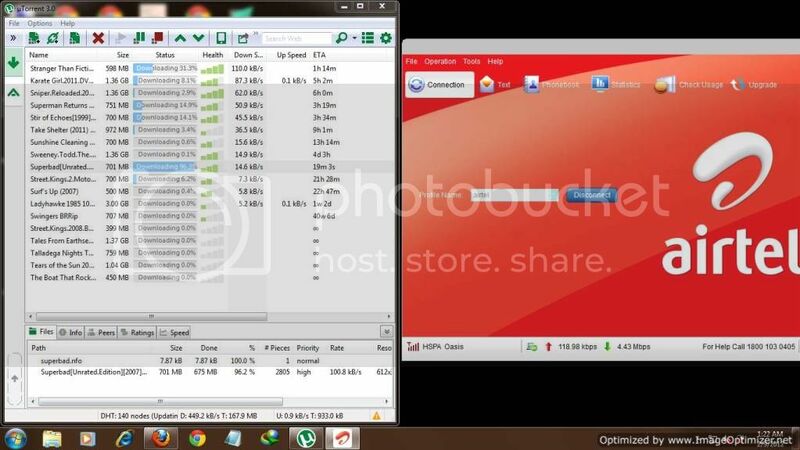 The speed test images showing downloading speed are pretty genuine and showing the real speed of Airtel downloading. I know that everyone is eagerly waiting for the Airtel 4G, since it is promising higher download and browsing speed that what Airtel 3G has been providing. As of now only the metro cities are going to avail the benefits of Airtel 4G Lite. Hopefully the 4G services will be started for normal users in all over the country and then I will be sharing the Airtel 4G download speed test results. There have been lot of predictions about Airtel 4G to be the best internet connection, India can ever wonder about. Great!! I have also used this app which is good to manage data usage and broadband connection. Thanks for sharing the features of my Airtel app. Great, But i think speed is not same in all region. It depends on city. Usually we seen that Airtel provides high speed in metro city or in urban area. But if we switch to small town or villages. It is same as other service provider did. Speed test results of Airtel 3G are not same at all places. 3G wireless internet speed varies accordingly to area. I recommend Airtel broadband service rather than using wireless internet at your home. Airtel internet services are best but its tariffs are not economical. The new 3G and 4G services are good in Pakistan in comparison to older one. Airtel data cards are the best 3G data cards available right now. Although its costs are high but still it is worth it. The Airtel 3G Speed is really high as compared to other providers. Honestly I have not used Airtel 3G data, but after I saw a your review, I have become interested in using Airtel 3G internet. Airtel 3G is working quite well with high speed but sometimes it breakdowns but overall nice service and speed. Get Airtel 3g Working proxy trick enjoy free Unlimited 3g Internet !